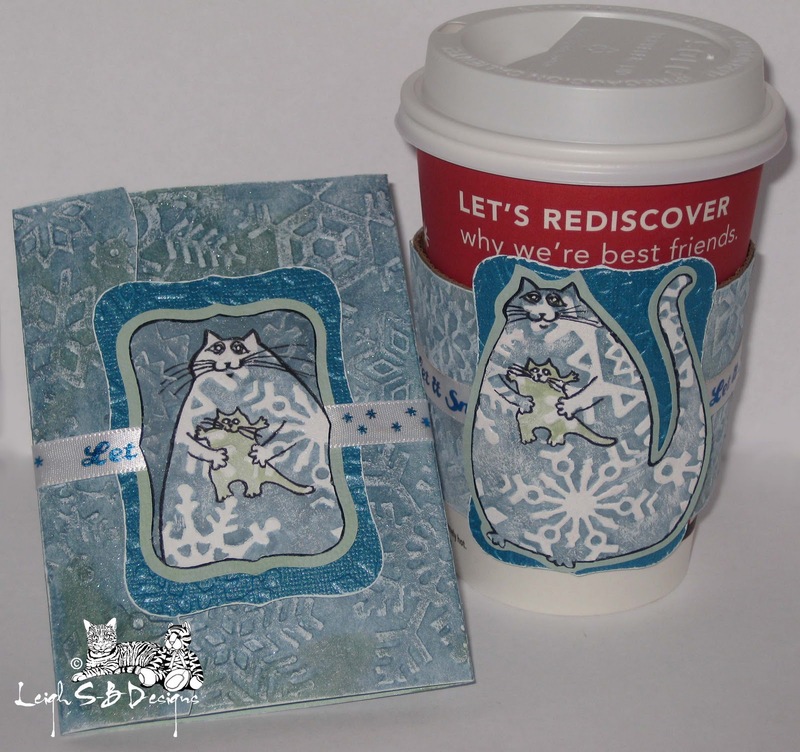 Velvet Paw Creations: Holiday Beverage Sleeve and matching Gift Card Holder for Feline Lovers - A Third Coast Creative Coterie Creation! 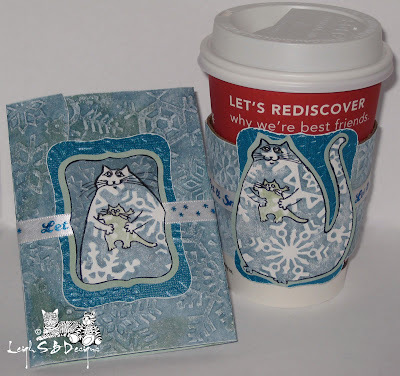 Holiday Beverage Sleeve and matching Gift Card Holder for Feline Lovers - A Third Coast Creative Coterie Creation! Winter definitely arrived over the weekend down here in San Diego with lots of rain...bbbrrr! 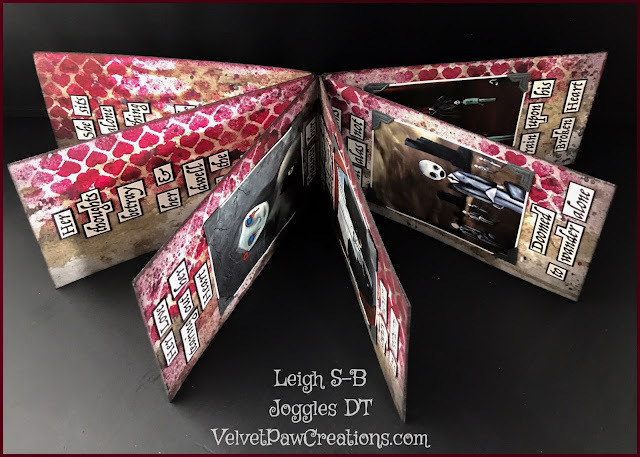 The inspiration for this Holiday Beverage Sleeve and matching Gift Card Holder came to me while savoring my first Eggnog latte of the season, oh yeah! 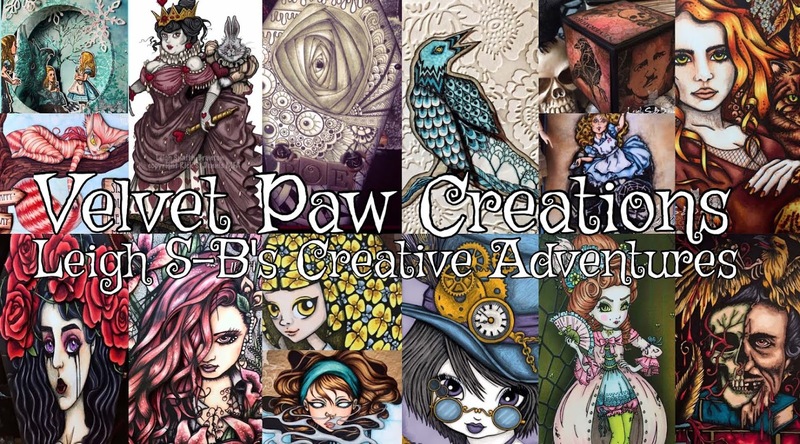 My kitty winter themed combo creation would be perfect as gifts for feline loving co-works, friends and family! 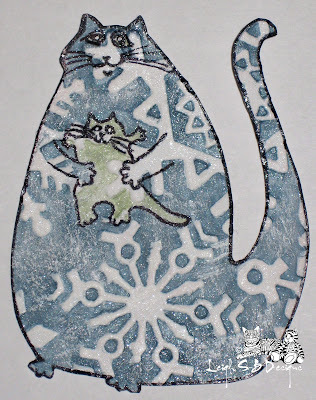 I used the quirky little cat image called Mini Me (ES-200-I) by Third Coast Rubber Stamps as the star of the show and a Snowflake Cuttlebug Embossing Folder for the rest. 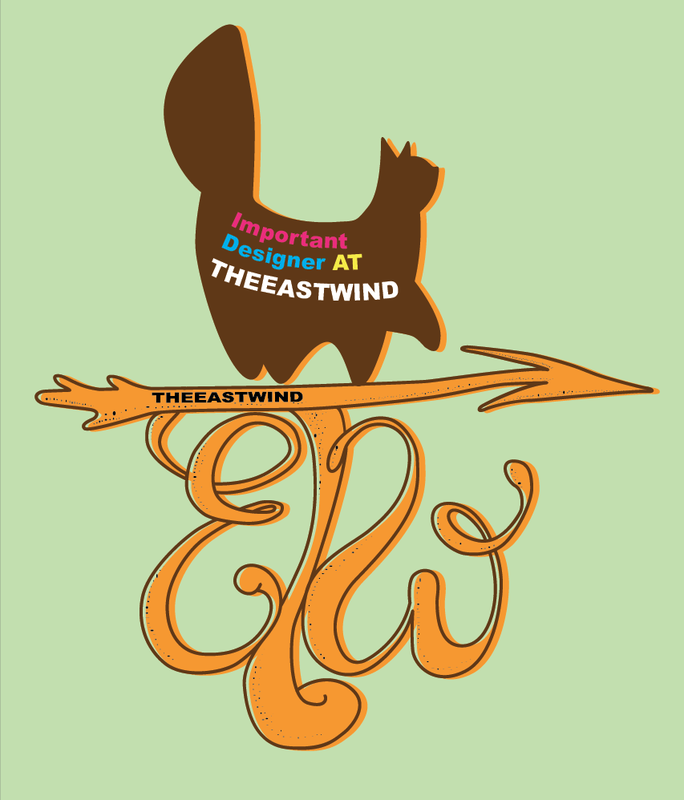 Stamp the Mini Me kitty twice onto white cardstock with Memento Tuxedo Black ink. 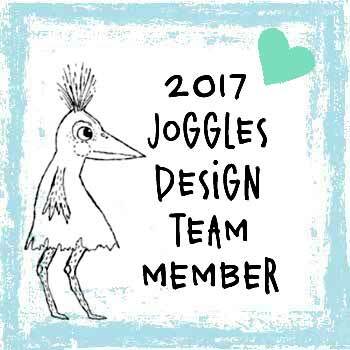 Trim one by closely following the outline of the image and die cut out the second with a small Spellbinders Label 8 die. 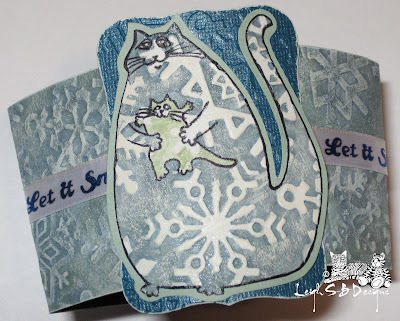 Emboss both kitties with the Snowflake design and paint the debossed areas with Distress Stain Stormy Sky and the little kitty with Distress Stain Bundled Sage. Apply more Stormy Sky to the background of the 2nd image to make it darker. 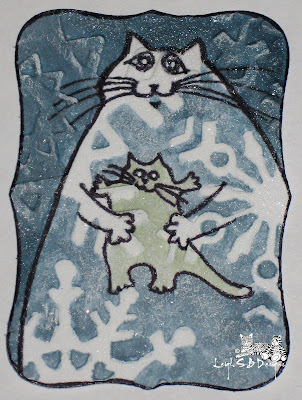 Drybrush over the embossed snowflakes on both kitties with white acrylic paint to highlight them. 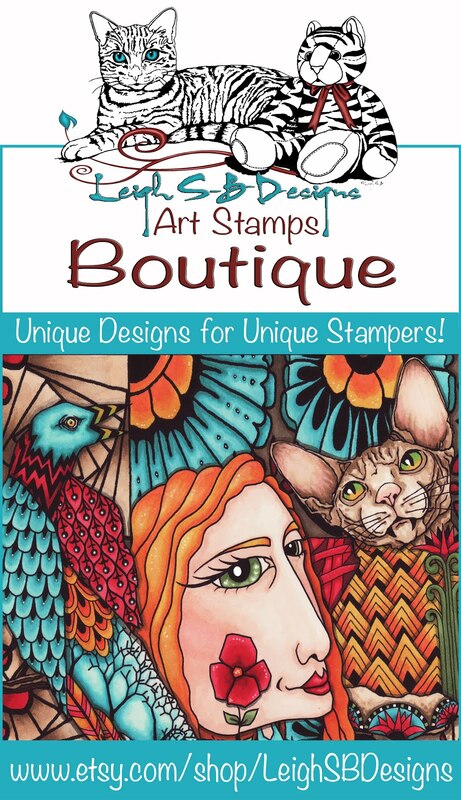 Draw over the stamped lines where needed with a black Sharpie to make the image stand out again. Add a magical and wintery sparkle to both with a light misting of Vanilla Shimmer Smooch Spritz. 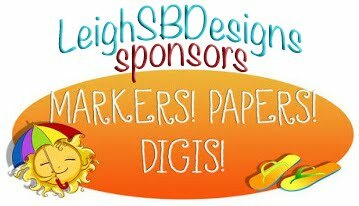 Edge the die cut one with a black Sharpie marker. 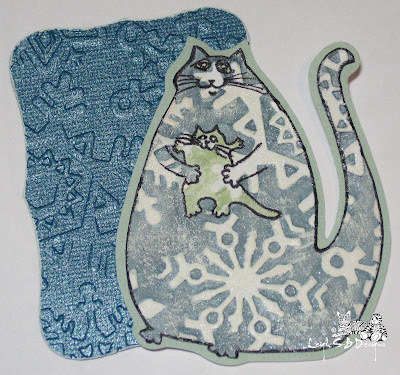 Adhere the cut out kitty to a blueish-sage piece of paper with a glue stick and trim. For the second kitty die cut a slightly larger mat from the blue-sage paper and adhere it to the paper mat. Die cut two slightly larger Spellbinders Label 8 mats from metallic blue cardstock and distress the edges on both with white acrylic paint. 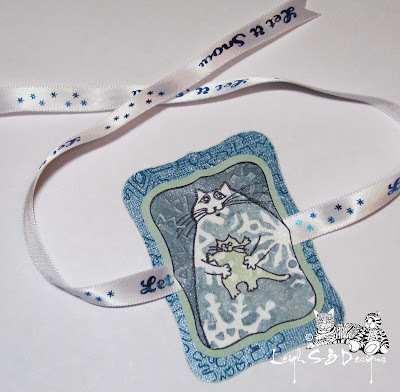 To make the Belly Band for the Gift Card holder sandwich a length of "Let It Snow" silk ribbon (Michaels) between the kitty panel and the metallic mat as shown. Adhere the mats together with the ribbon in place with Crafter's Pick The Ultimate glue. Trim the ends of the ribbon into dove tail points. Use a beverage sleeve as a template and cut a piece of white cardstock slightly larger. Run the piece through a Xyron to add permanent adhesive and adhere it to a sheet of the same blue-sage paper. 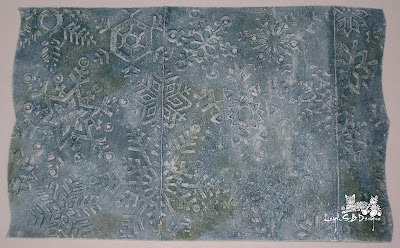 Emboss the snowflake design into the panel. 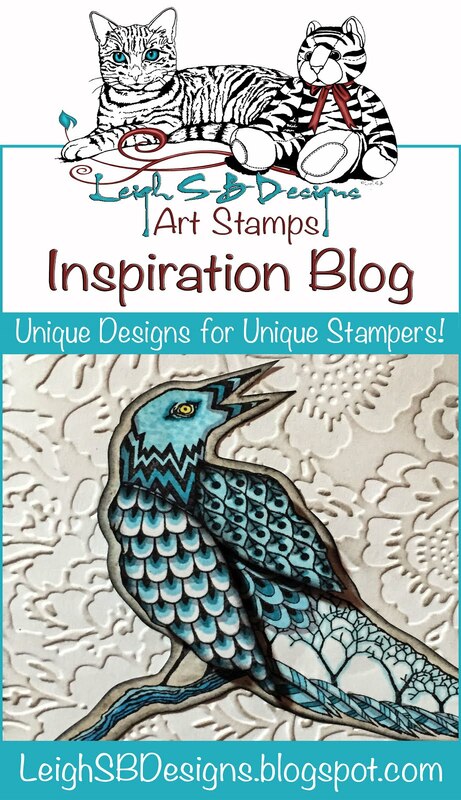 Apply Stormy Sky Distress Stain directly to the cardstock in a random fashion so that some areas are more saturated than others. Apply a small amount of Distress Stain Bundled Sage for a variegated effect and allow to dry. Run the cardstock through a Xyron again and adhere it to the original cardboard beverage sleeve. 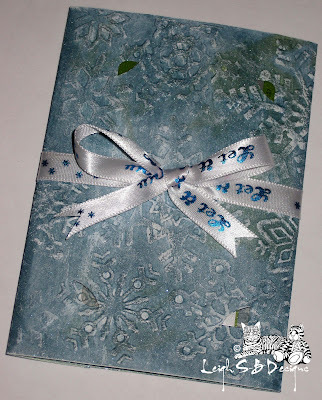 Trim away the excess cardstock and drybrush over the embossed snowflakes and the edges of the sleeve with white acrylic paint. Spritz the sleeve with Vanilla Shimmer Smooch Spritz. Adhere another piece of the "Let It Snow" ribbon around the center of the sleeve with a glue stick. Overlap the ends of the sleeve and adhere together with The Ultimate glue. To complete the Beverage Sleeve adhere the kitty panel to the front with TU glue. 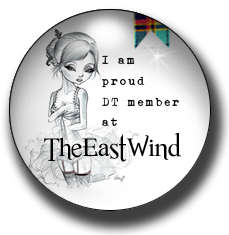 Now for the Gift Card Holder. I made a template based on a standard gift card and traced the shape onto a piece of white cardstock. Run it through a Xyron to add permanent adhesive. Adhere the panel to the same blue-sage paper and and score and crease two folds to form the flaps. Cut 4 notches into the center section with an Xacto knife - this is where the gift card will sit. 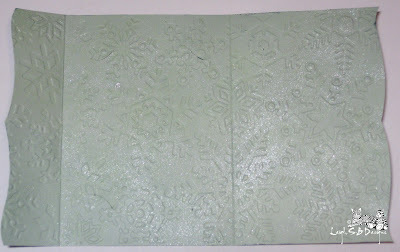 Emboss the panel with the snowflake design and cut out the Gift Card Holder. Apply the same colour treatment to the Holder as I described above for the Beverage Sleeve. Complete the Gift Card Holder by inserting the gift card inside and securing the holder closed with the Kitty Belly Band and finish with a bow tied at the back. Great job. 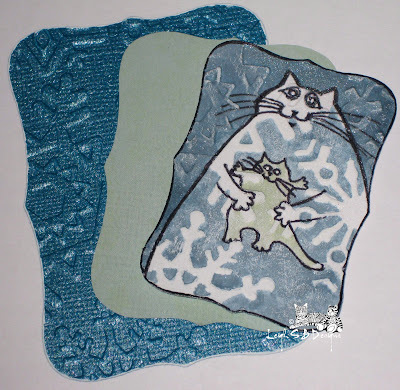 Wonderful idea using the embossing folder on the cat. Thanks for joining Speedy the Cats Friends. 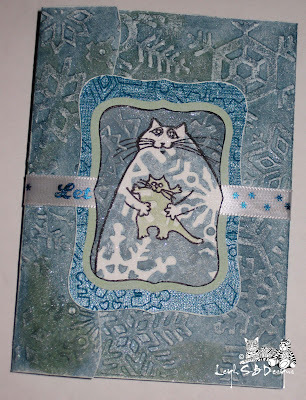 I love the embossed kitty and the color scheme! Karen - Oh yes! Anything that can be wrapped or needs a cozy would be perfect! 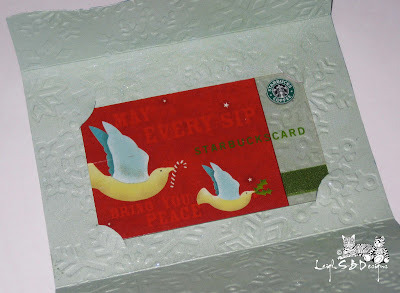 What a fabulous idea for a starbuck's gift card! I might have to do this myself for a friend! 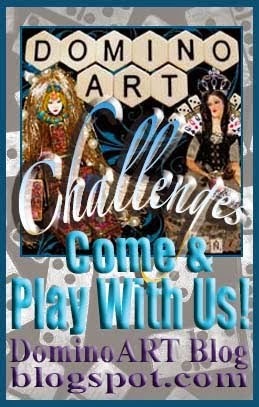 Thanks for playing with us at Wee Memories! A coffee cozie! 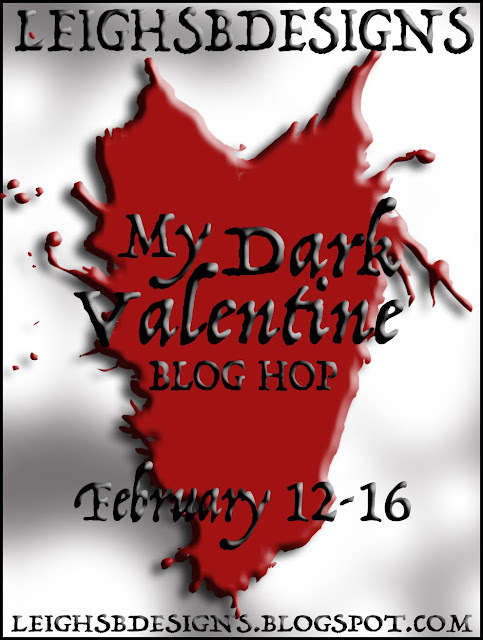 VERY cute idea to pair it up with a GC to a coffee shop! Thanks for playing along with Wee Memories! Thank you everyone! 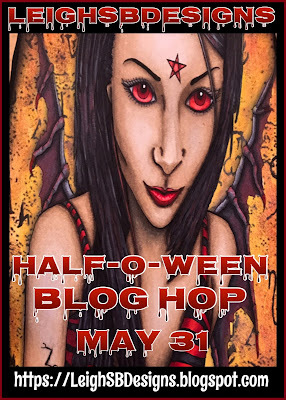 I'm so happy you all like my little giftie set ;0) Hhhmm I can hear an eggnog latte calling again LOL! great idea, nice tutorial for us Thanks for joining Speedy the Cats Friends this week. Good luck to you. .